C and S coaches are delighted to offer golf trips across the country. We understand the need for careful transportation of your golfing equipment as well as the members of your golfing party so will provide coaches with extra luggage space. 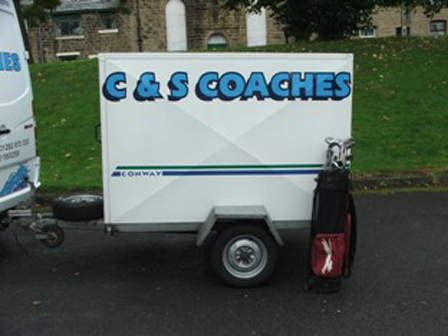 We also have a trailer for your golf equipment If the mini bus is full up with passengers.
" Dear Emma and staff Just a note to say how much my party and I enjoyed travelling to Wetherby racecourse and back on your coach for my 60th birthday on 19/03/2019. The day was amazing and our driver, Joel, got us off to a great start with his wit and politeness. He also finished the day off by delivering us all back to Burnley with his safe driving. May I also say that the coach was immaculately clean and I would recommend your service to anyone. Thank you for your part in providing such a memorable day. Regards Peter Harper "
" ‘We would like to thank your driver Dave for his extremely [professional conduct this morning when transporting day time support service members into our Walton Lane Centre and his driving were exemplary.’ "
" On behalf of Christie’s I would like to thank you for helping raise yet another amazing £2373.00 and your ongoing fundraising is very much appreciated. "